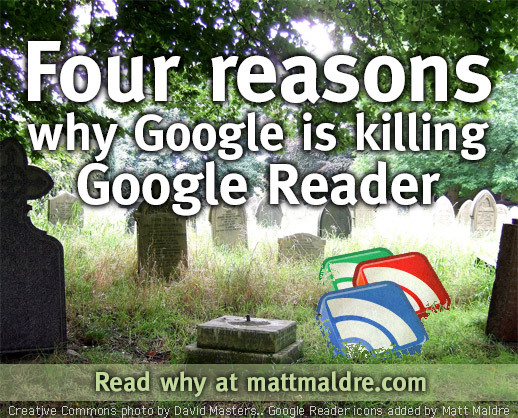 Why would Google kill Google Reader? There are a few false excuses floating around. Some people are saying Google is focusing on their core efforts. Others are claiming that RSS is a dying technology. Both of those reasons would be extremely false. lol. Yeah, that part. That’s the “full version” of their mission statement. The one they share with the public is the condensed version. heh. So true. It’s like taking a quote from Triumph the Insult Dog and removing the “FOR ME TO POOP ON” part. More response on the second part of your comment in an upcoming blog post. 🙂 It ended up so long, on a topic that I’ve been wanting to write about, I figured to make it a post on its own. Today Google changed the layout of Google Plus to use a double-column design for the posts. Much like Facebook’s double-column. I’m starting to think Google’s primary objective is to be like Facebook. Not to defeat Facebook, but to be like Facebook. Since Google Reader is not like Facebook, therefore, Google gets rid of Google Reader.